Well, it didn’t take long for the El Bolso jinx to take effect. 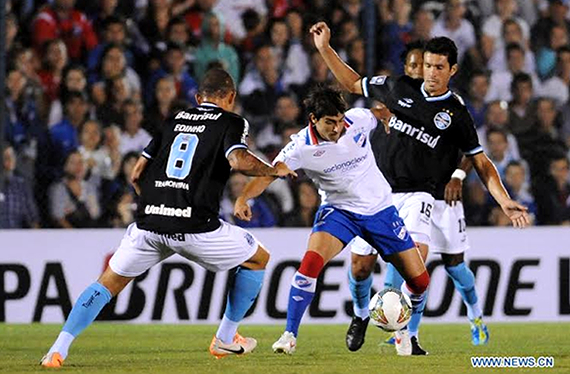 Nacional put itself in a tough spot by losing their first game of the group stage, at home no less, to Gremio. In a group this tough, it will be difficult to make up lost ground, although after watching this game I am confident that the boys in white can pull it off if they learn from their mistakes. First, let’s learn a little bit about Gremio. The team is based in the Southern Brazilian city of Porto Alegre (the happy port), which is the major city that is closest to the Uruguayan border (El Bolso visited once upon a time and loved the feijoada, the traditional Brazilian black bean and pork stew, so much that he had to be dragged away from the buffet table by his parents). Gremio is one of two major teams in the city, the other being Internacional, and is by far El Bolso’s favorite Brazilian team. First, they wear beautiful striped jerseys in teal, black and white which earned the team the nickname “Tricolores.” Second, they are Internacional’s big rival, which was the team Nacional defeated in the 1980 Libertadores final, when El Bolso was but a wee boy; the enemy of my enemy is my friend, and all that. Third, two of El Bolso’s favorite Nacional players have spent time wearing the Gremio jersey: Sebastián “el Loco” Abreu (although to be fair, is there a team in South America and Mexico that Abreu hasn’t played for at this point? ), and backline defender and team leader Hugo de León. 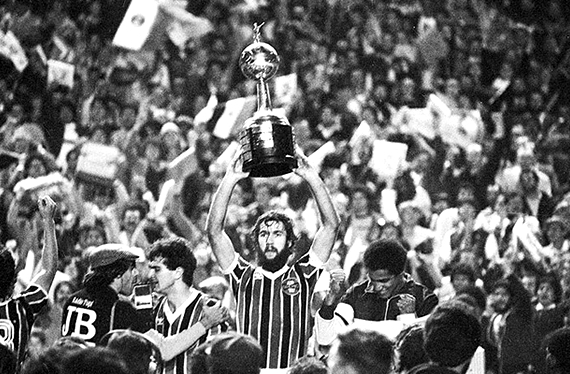 At Nacional, De León has been synonymous with championships: his initial run with the team culminated in that 1980 Libertadores win, and he was so impressive that Gremio signed him away from Nacional immediately following that series; so much so that he missed the team’s Intercontinental Cup win against Nottingham Forest later that year. De León quickly became a referent and team captain at Gremio, and was instrumental in the club’s first Libertadores trophy in 1983, which they earned by beating hated Nacional rival Peñarol (have I mentioned I like Gremio?). He also became a fixture on the Uruguayan national team, helping to win the 1981 Mundialito (a friendly tournament featuring all the World Cup winners of the day). After a few more years in Brazil and a couple of seasons in Spain, an older De León returned to Nacional in 1988 and captained the team to a Libertadores Cup win over Newell’s Old Boys, and a penalty shootout victory in the Intercontinental Cup against perennial Dutch power PSV Eindhoven. After retiring in the early 90s, De León became a coach in Brazil and again returned to Nacional in 1998. Peñarol had just won their fifth consecutive league title and seemed poised to win an unprecedented sixth cup, but De León led his team to victory that year and two of the next three tournaments after that before leaving. He then tried his hand at politics as the VP candidate for the conservative party, which didn’t go so well (they pretty much got votes from extended family and not much more), but he is still mentioned every time Nacional makes a coaching change. Let’s get into the game. In my opinion, Nacional didn’t deserve to lose, although they didn’t do much to earn the win, either. The game was not a great one, with neither team able to create much in the way of offense. Nacional has not yet found a forward to partner with Ivan Alonso; in the local league that may not be a big problem, as Alonso is good enough to find the net once or twice per game even with opponent’s entire defense keyed on him, but this group is a different story. Lacking in legitimate options up front, Pelusso has chosen to populate the upper half of the field with creative midfielder types like Pereiro, De Pena and Cruzado, but that’s not enough to keep defenders off of number 24. Nacional ends up trying too hard to create the perfect play for Alonso, and waiting for the last twenty minutes of the game, when they can throw Alvaro Recoba out there and hope for one of his patented miracle plays. On the defensive end, the team looked nothing like it has so far this season, and that’s a good thing. Scotti and newcomer Jorge Curbelo were solid enough in front of Munúa (once again the rock of the defense), and the wingbacks, Alvarez and Diaz, had a great night as they hemmed in the Brazilian wingers and helped out in the middle of the field. Gremio’s attackers managed only a couple of good chances in each half, but Nacional could do no better. The game was scoreless at the half and remained so for a good chunk of the second, until a great setup by the Gremio attack in the 68th minute left Cristian Riveros all alone in front of the goal. He headed the ball into the corner (nothing Munúa could do about that one) and Nacional was down 1-0. Nacional trotted out Recoba and promising forward Juan Cruz Mascia to try to even the game. Recoba showed his skills with a couple of long passes (from the midfield strip to the edge of the box), but the finishing was lacking. Alonso should have had a chance to equalize from the penalty spot, but the referee called for a free kick just outside the box on a ball that clearly struck a defender’s hand a good foot inside the line. After that there were only some desperation long balls and little more before the referee blew the final whistle. Nacional is in a tough spot now. Every team in the group is rock solid, and they’ve lost three points at home. It’s not looking good for the Tricolores (the Uruguayan ones at least), but the change in the team’s defensive outlook, plus the knowledge that they might soon be able to throw Nacho Gonzalez out there in partnership with Alonso, make me believe that they can find their way into the knockout phases. For that to happen, however, they pretty much need to win their next game, on the road against reigning Argentinian champion, and historical Nacional Libertadores punching bag, Newell’s. I’ll be here to tell you all about it and tell some more stories about the good old days.